This is the free tea party coloring page. 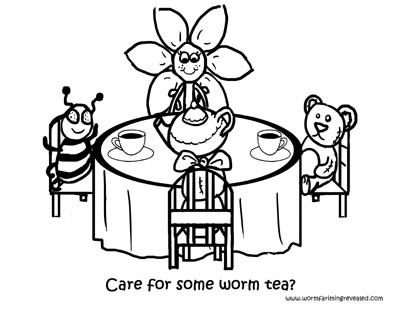 It's a printable coloring page for kids to help educate them and peak there interest in worms, worm tea and gardening. Worm tea is beneficial for plants in so many ways. It's like a super drink that helps them grow big, strong and with lots of fruit. It also helps them fight unwanted bugs. I can't say much for the stuffed animals though. Print Tea Party Coloring Page Now! You must have a PDF Reader to view and print. If you don't then click hear to be able to download the printable coloring page. "Why haven't you touched your Tea? Would you like some sugar or maybe some cream?"